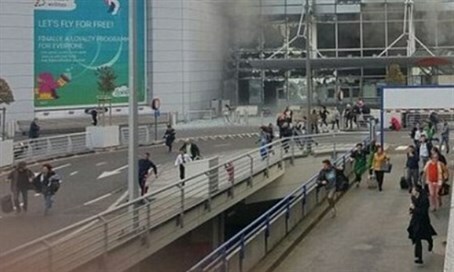 Explosions were heard at airport in Brussels, reports indicate 13 killed, 35 injured. An Israeli is among the wounded victims. Two explosions were heard at Zaventem airport in Brussels early on Tuesday morning, Reuters reports. Belgian media announced that 13 people were killed and 35 more were injured by the blasts. Belgian public radio has now reported that at least one of the explosions was a suicide bombing. London-based Sky News said the blasts had occurred in the departures lounge and cited reports it had occurred near the American Airlines desk. These reports have yet to be confirmed by an official source. Travelers have since been evacuated from the airport. Witnesses reported that gun shots were fired prior to the bombings, accompanied by shouting in Arabic. One Israeli was wounded in the attacks. The Foreign Ministry is currently investigating whether any other Israelis were injured in the explosions. The airport has been shut down. Rail traffic to the airport has also been suspended until further notice, according to local news agencies. One flight headed to Brussels from Israel was diverted to another airport, Airport Authority said. The first flight meant to depart Brussels for Israel is scheduled to land at Ben Gurion International Airport at 3:00 pm.